Successfully selling your goods and services is certainly the most important part of your business. But actually billing your customers and clients for the work you’ve done, and then collecting what you are owed, is also a vital component of keeping your doors open. Not only that, but getting your customers to pay you quickly–or at least on time–can vastly improve operations, cash flow, and your bottom line. There are a number of steps you can take to encourage your clients to pay your bills and statements in a timely manner–as well as ways that you can make even your best customers pay faster. Let’s take a closer look. Send your bills consistently and quickly. It’s no surprise that billing your customers quickly can result in quicker payments from them in return. But what you may not know is that being sure to consistently send bills can also increase the chances of your customers’ payments. The more predictable your bills, the more prepared they will be to pay. In addition, if you wait too long to bill, bills may become larger and more difficult for your customers to pay. Make your statements and invoices as clear as possible. If your bills or statements are complex or cluttered, it can confuse and overwhelm your customers. Instead of quickly paying their bill, they may toss it aside to look at later or ignore it altogether. Your statements and bills should have clear, detailed itemizations and lots of white space. Make sure to invest in stellar customer service. Many customers delay payment because they have a question that they need answered by about their bill. The better your customer service, the more quickly they can get answers and mail their payment. Be sure to put a customer service phone number in a prominent space on your invoice and to include any web addresses to online help as well. Offer an incentive to pay quickly. Did you know that humans respond to rewards better than they respond to punishment? Offering an incentive to paying early (such as a small discount, or a future sale) can be much more effective than a late fee punishment. Send reminders. It’s extremely easy to send a late payment reminder letter. 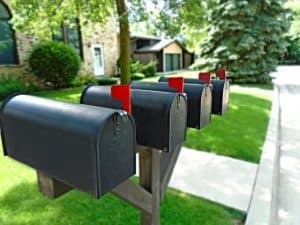 One of the biggest benefits of working with Towne Mailer is that we can guarantee that your bills go out as quickly and consistently as possible. Our team can also work with your team to make certain that your bills, invoices, and statements are as clear and clutter-free as possible so that your customers understand their mailings. Ready to try our printing and mailing services? Call us today at (888) 882-6245 or contact us online to learn more about our services or request a free job quote.